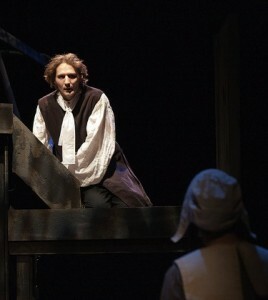 David Fetzer created the role of Arthur Dimmesdale in Jenifer Nii’s adaption of THE SCARLET LETTER in 2012, his final stage role. David passed away in December of 2012. His family has established the David Ross Fetzer Foundation for Emerging Artists, aka The Davey Foundation, to ensure that David’s love of music, film and theatre lives on. Watching David Fetzer work . . . no matter the medium or genre, you knew you were witnessing something special. Unique. The product not only of remarkable talent, but something . . . more. David had the extra “something” I think we all wish we had – that mystical quality that strikes to the very core, that gives heart and hands to words and ideas. In my play THE SCARLET LETTER, David added depth, grace, and humor to a character he admitted he didn’t see eye-to-eye with (if ever there was an opposite of the weak-willed Dimmesdale, it was David). He made what I’d written better. He made me want to do that writing thing better. More importantly, he did what true artists do: he made me think harder. Ask more. Dare. David made me better. Young playwrights: David Fetzer was the real deal. Turn in your very best work.